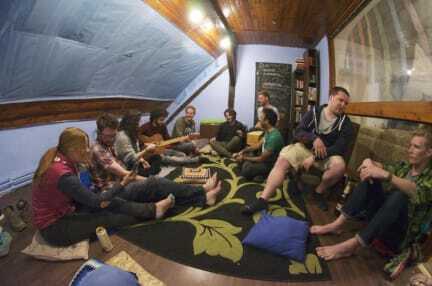 The Wild Elephants Hostel is not just a cheap bed in a great location. We offer you an experience unlike any other. Our volunteers are backpackers who would like to involve you in various daily activities, cook you delicious dinners and take you for a wild night out in the best local venues of Bratislava. The inclusive social environment we work on will easily make you a part of your new home away from home shared with up to 40 of your future friends. We might NOT be fancy, newly furnished or even professional, but we love what we do and we share this love with everybody who seeks an open minded place to have fun and meet people. best hostel in bratislava , thank you for the great 2 days! Great stay, perfect location and very welcoming staff! Helpful in every way possible! This cosy and vivid hostel makes you want to stay in the hostel instead of visiting Bratislava itself! Good hostel for party. Nice people, good atmosphere, best staff. Pedro was my favorite, because he shared his vegetables with me. What makes this hostel so great is the atmosphere, the location and the staff. A great place to meet and hang out with other travellers and have a great time in Bratislava. This is the most hostely hostel we've ever been to. For travelers by travelers. Really nice atmosphere but slightly chaotic. Pub crawl was really nice, without pressure. Placement is on 2nd floor but in the center of old town. Fijn hostel gelegen in het centrum van Bratislava. Er heerst een sterk sociale atmosfeer en de toiletten en slaapzalen waren schoon. De koude douches vormden feitelijk het enige nadeel tijdens mijn verblijf. Aanrader!